Francis "Frank" Thorne (age 54) of Mt. Airy, Maryland, who was born on March 2, 1948, passed away in his home surrounded by his family and friends on January 31, 2003. He is survived by his wife, Bernadette; his son, Louis; and his daughters, Kathleen and Meredith McDaniel. He is also survived by his father, Charles Jr. and wife, Eileen; his sister, Mary Ann Brewer and husband, Luke; brothers, Charles III "Leroy", Steven and wife, Sandra, Walter "Doug" and multiple relatives and friends. 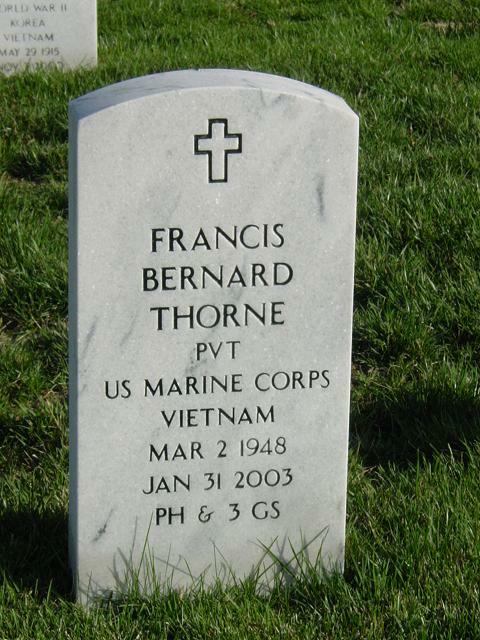 Frank was a highly decorated veteran of the United States Marine Corps. He served in Vietnam from 1967 - 1968 with 1st Battalion, 1st Marines, C Company. During this time, he was wounded in combat four times and received a Purple Heart with three gold stars. He also was awarded the Vietnam Service Medal with four bronze stars, The Presidential Unit Citation for Extraordinary Heroism, Combat Action Ribbon, The Presidential Unit Citation, Two of The Republic of Vietnam Meritorious Unit Citation (Gallantry Cross Color and Civil Actions Color First Class), The Republic of Vietnam Campaign Medal, The Rifleman Sharpshooter Badge. We would like to extend our appreciation for the love and support shown by The Raffo Family, Jennifer Grant, Kathy Ernst, Bonnie Thorne, Doug Mason, Karen and Paul Ricupero, Lenora Monchecourt, Marcia Carroll and many caring friends that were there in our time of need.